Jack and I have been wine club members at Williams Selyem for several years now, and one thing we always look forward to with our biannual wine pickup is the seasonal recipe that is included. We always make a point of trying out these recipes, and they have yet to let us down. Each recipe also includes a recommended Williams Selyem wine pairing. The first (and favorite) recipe we tried was for Holiday Cioppino. 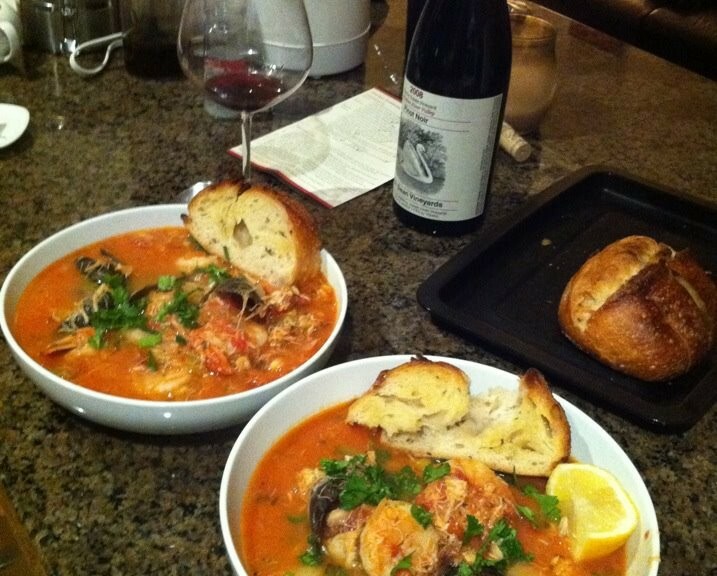 Cioppino is a fish stew that originated in San Francisco’s North Beach (“Little Italy”) in the late 1800’s by Italian fishermen (mostly immigrants from the port city of Genoa). It is traditionally made from the “catch of the day,” which typically includes Dungeness crab, clams, shrimp, scallops, squid, mussels, and fish (all from the Pacific Ocean). The seafood is combined with fresh tomatoes in a wine sauce and served with toasted bread (preferably local sourdough). 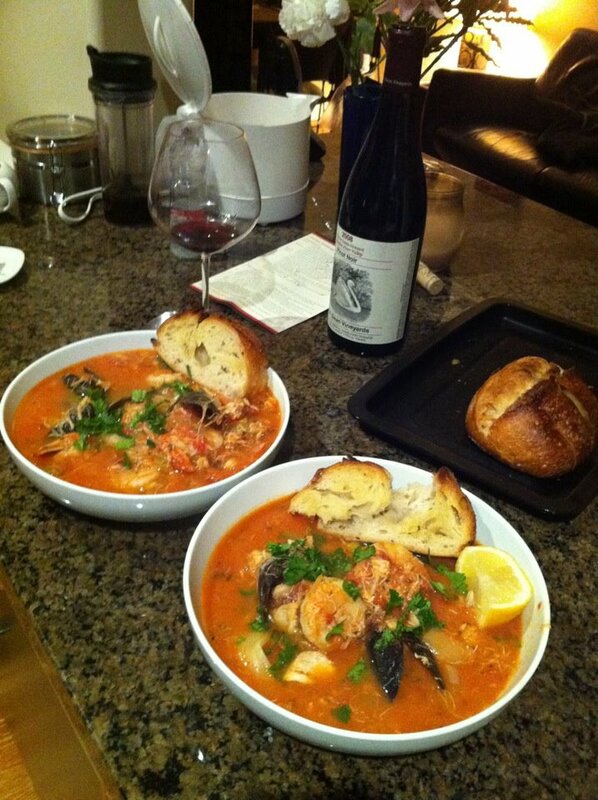 Jack has made this Holiday Cioppino on several occasions: Thanksgiving for the two of us (when I had to work), dinner parties with friends, and (just yesterday) Thanksgiving dinner for my whole family (nine of us total). Jack has made modifications to the recipe over the years, but the base of the soup has stayed pretty much the same. It’s a great treat on these cold winter nights! 1 quart chicken broth (recommended low sodium) – Edit 6/27/16: we substituted vegetable broth when we were hosting a pescatarian friend at our house and the finished soup still tasted incredible! In an extra large stockpot over medium heat, warm the olive oil. Add the onions, leeks, and bell peppers, cook, stirring frequently, until the onions have softened or are nearly transparent. Note from Laura: consider adding pancetta at this point for a smokey flavor. Add the garlic, bay leaves, oregano, rosemary, and thyme, season with salt and pepper to taste. Stir well and sauté, about 2-3 minutes. Add the tomato paste and stir to combine. When the tomato paste starts sticking to the pot, pour in the white wine, start scraping the bottom of the pot to combine all the ingredients together. Bring to a boil and cook until the mixture is reduced by half. Add the clam juice, chicken broth, crushed and chopped tomatoes, and stir well. Add the seafood (except mussels and clams). Bring soup to a boil; lower the heat to a simmer and cook for about 30 minutes. Note from Laura: steam mussels and clams separately to ensure they open (discard any that do not) – be sure to add any released juices to the finished soup. Season to taste with salt, pepper, and lemon juice. Garnish with chopped parsley and serve with fresh crusty bread. Pair with Williams Selyem 2009 Drake Estate Vineyard Chardonnay.